Currently the largest coho run to date are on the spawning areas of Spring Creek, with many cohos caught in the lower Sauble River by anglers this fall. Spring Creek is the only steam in the area with a natural reproducing population of coho salmon. The Hepworth Anglers Club (HAC) thank Trillium Mutual Insurance for their $2,000 contribution received from the ROOTS Community Fund, which will be used as part of their ongoing Spring Creek Restoration Project. These funds have been used to plant trees on both sides of Spring Creek acting as a buffer, protecting HAC’s restoration work completed in the lower section of Spring Creek. Spring Creek hosts a large natural reproducing migratory fishery consisting of chinook/coho salmon, rainbow/brown trout, and also adds a significant volume of high quality cold water to the Sauble River, enhancing the water quality in the river and Lake Huron. HAC’s Spring Creek stewardship/restoration efforts supported by our neighbours, community partners and individuals, will ensure that these public benefits continue into the future. The HAC also appreciated Trillium Mutual’ volunteer program, with their employee Steve Sherreff assisting with the bio mass studies conducted in Spring Creek. Bio mass studies are used to determine the success of the Hepworth Club’s restoration efforts. 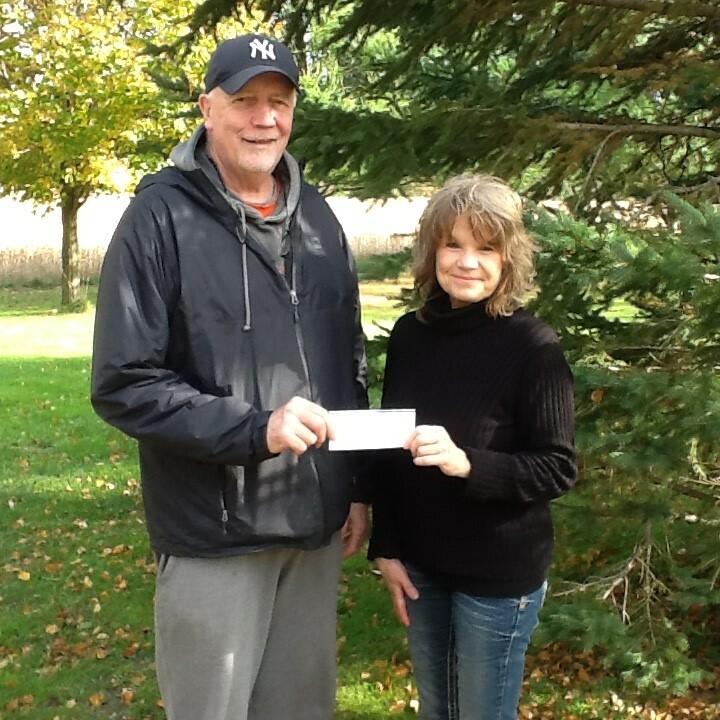 Shown below is HAC secretary Rick Rusk presenting a cheque to Heather Barnes, recipient of the tree project. Heather has removed eleven acres from cultivation on both sides of Spring Creek, signing an agreement with Grey Bruce Alternating Land Use Services (ALUS) and plans to plant additional trees in 2019 assisted by the HAC and Trillium Mutual Insurance.